Q: What is Swervin’ n’ Curvin’? 1) How Pioneer Square bar hoppers get home at 2:00 am. 2) How bike racers commute along the Burke-Gilman Trail. 3) An informal wine country ride to raise funds for farm workers. So Chuck learned the mechanics of bikes, and began his four-decade affair with sustainable transportation. Chuck started commuting in college to his summer job at a furniture factory in High Point – the “Furniture Capital of the World.” After college, he cycled to work in Washington D.C., where he did not own a car for practical purposes. Like three European road tours. But outside of those international trips, 95% of Chuck’s cycling occurs on his daily commute. He estimates he rides 70 miles on a good commuting week. His work includes helping refugees secure work – sometimes by commuting on donated bikes [ed note: see article on the Iraqi engineer “Ali” in the June 2010 issue of the Courier]. In the fall, Chuck coordinates a Wine Country Ride in the Yakima Valley to support farm workers. Swervin n’ Curvin’ now attracts up to 100 riders. Over 80 miles in two days, cyclists enjoy tasting Northwest wines from Thurston Wolfe, Tefft Cellars, and other wineries. The informal weekend event has generated as much as $9,000 for nonprofit groups supporting seasonal agricultural workers, like the Farm Workers Pesticide Project. The fundraiser was inspired by Chuck’s job at the Washington Toxics Coalition, which promotes better pest management and the use of safer products (natural alternatives to chemicals). In the spring, Swervin n’ Curvin’ cyclists join Chuck’s table at Bike Works’ annual auction. Chuck even operates his own ad-hoc Bike Works — buying and repairing used bikes to resell on Craigslist at affordable prices. His goal is to setup or resell 20 bikes each year, primarily to connect new riders with bikes that will serve their needs and therefore be ridden regularly. Chuck is quick to add that he refers many of those buyers to local shops when they need service or parts, or when they are better prepared to purchase new bikes which are right for them. A self-declared yard sale junkie, Chuck says his favorite bike accessory is a hula dancer mounted to his front handlebars. The mojo attracts a lot of comments, so it’s a great ice breaker on rides. Of course, with his small town hospitality and outgoing nature, Chuck doesn’t need much help engaging fellow riders or other folks. 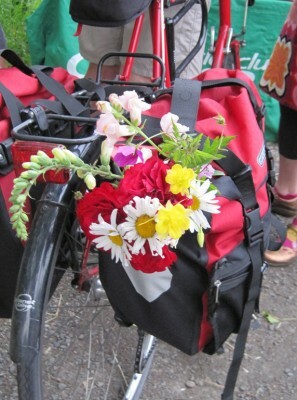 Recently he was photographed delivering birthday flowers by bike to one of his favorite baristas. And strangers also benefit from Chuck’s generosity. If you break down on the Burke-Gilman Trail, you may hear someone ask “Do you have what you need?” Chuck will reach into his Santa-size panniers for spare tubes, tires, tools, or tire levers to help you get back on your way. Particularly over the last several years, Chuck has noticed that Seattle residents are more aware of cyclists. “In the 1980s, I felt completely invisible.” He notes that bikes and cyclists today are better lit, and the infrastructure has improved. Chuck joined Cascade to learn more about the cycling community and to support effective bike advocacy. “I love reading the Courier articles, particularly the Miss Panniers column.” Stay tuned for a guest column on the etiquette and proper setup of bike lighting. This fall marks the 20th anniversary of Swervin’ n’ Curvin’. Scott Marlow was marketing director for Cascade Bicycle Club from 2001-2005. The Club record-holder for the shortest commute (under six seconds), he provides website design and communication services from his home office in West Seattle.